My favorite resting spot! I didn't know that you could see me! Another picture? Hurry! We've got to go out! Tippie is a small white and apricot little fellow that while beginning to walk would tip over. He is fearless, and not afraid of any thing or anybody. He is the offspring of two very black and curly coated poodles - his Mom & Dad. He took after Dad, in that he is 5 lbs. He’s also very quick on his paws. Interesting that a litter mate is twice his size, the color black, and has a little white beard. Tippie uses the stare down technique when he is trying to get your attention. His favorite past time is laying on his back to have his tummy rubbed. He loves to run in the yard and sleeps with his little head on the pillow during the night. Tippie is my favorite poodle in the household, but don't tell his poodle family, they would be hurt. Thank you Deane for submitting two very adorable pictures! Thanks for telling us a little about Tippie! He’s a cutie as are your other four poodles! 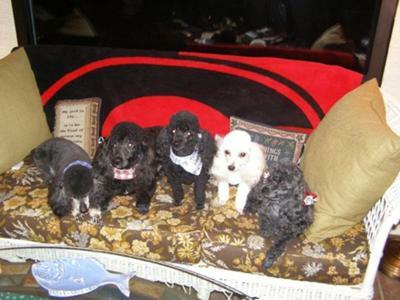 It’s very interesting to see the different colors on the poodle puppies with both parents being black poodles. The parents should be proud as they were blessed with three very adorable puppies! I’m sure the stare down technique works very well! And Tippie knows it! It’s very hard to resist an adorable little poodle face staring at you patiently, waiting for you to look at him to cater to his needs! Holly did that, too. Like Tippie, she thought and acted like a dog who was 3 times her size! Toy poodles are very funny to watch as they think they are bigger than the biggest dog (and people housemates) out there! 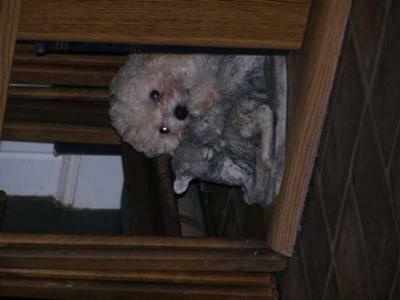 Toy poodles also have larger than life personalities. For such small dogs, they can have a bigger mouth than the standard poodles do! Thanks again for sharing your beloved poodles with us and our readers. Join in and write your own page! It's easy to do. How? 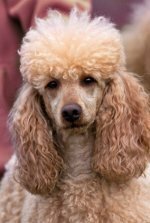 Simply click here to return to Poodle Pictures.